It's no secret that I love binding!! While many people dislike this step I enjoy each part of it. From selecting the fabric, to making the binding, and all the way to sewing it on by hand!! I get a lot of questions about binding and as a result I thought I'd put a few posts together that have "binding basics" information. This is a long post that goes over many topics. If you have any questions please leave them in the comments and I'll do my best to answer them in an upcoming part of this series. As a response to all of the amazing questions brought up over the weekend I filmed a video to answer some of them. 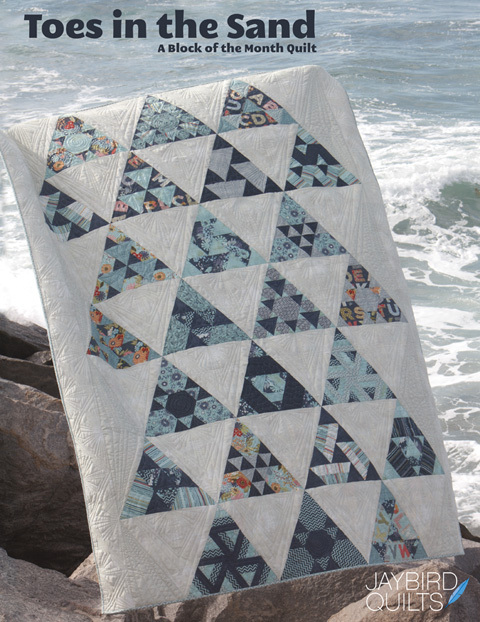 Binding is the last step in completing a quilt. It serves the purpose of covering the raw edges of the quilt top, backing, and batting by encasing them. I'm a personal fan of stripes cut on the bias for bindings. Straight of Grain or Bias Cut? I get asked this question very often. I've learned the difference between the two over the years by working at a quilt shop, taking classes and reading many books. The #1 reason to use bias cut binding over straight of grain binding is strength. Please look at the video for a full explanation on why bias is stronger. Here is a table that shows the pros & cons of straight of grain binding versus bias cut binding. Keep in mind I use both and let the project decide which is best. Also note that the design of a print may also dictate which one is best. Here is my personal recommendation. Use SOG for wall quilts and things that will not get a lot of use. 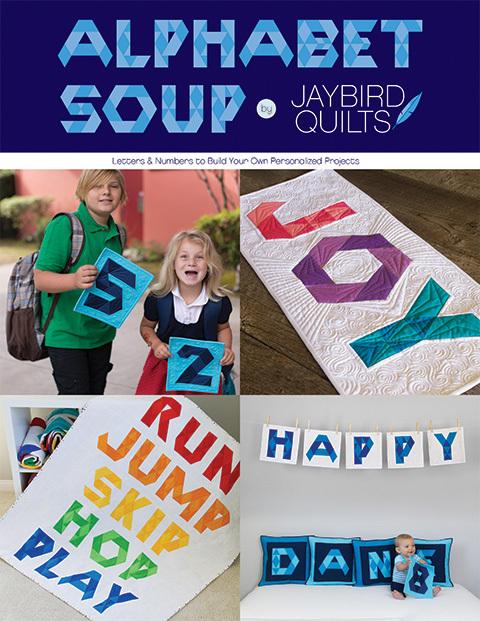 Use BC for bed quilts, lap quilts as well as anything you plan on washing frequently. 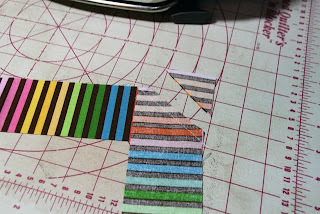 I will show a few options on how to cut bias strips in Part 2. 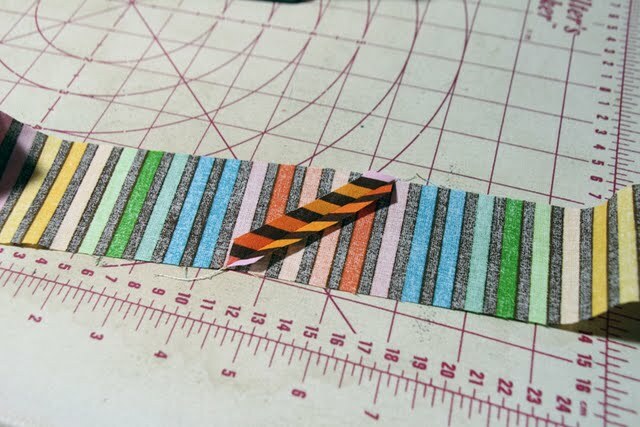 Unless you are making a tiny quilt, chances are you'll have to piece multiple strips together to make the length you need of binding. To calculate the length of binding you'll need add all the sides of the quilt up and add 10" to that number. If you are making SOG binding take that number and divide it by the useable WOF of your desired binding fabric. In general I use 38" to account for seams and error on the side of making more rather than cutting it close. 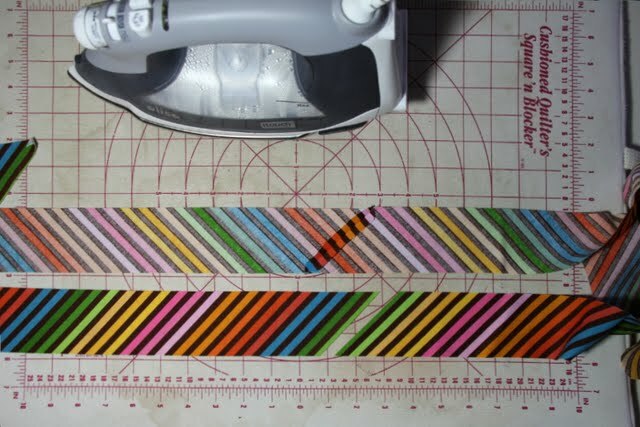 Round up to the next whole number and that is the number of binding strips you need to cut. 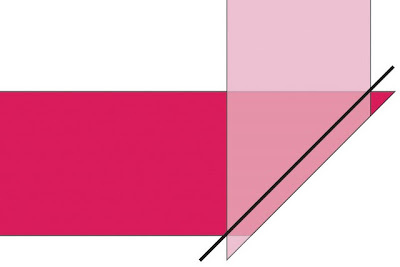 The method for finding out how much binding you'll need is the same for SOG and BC. 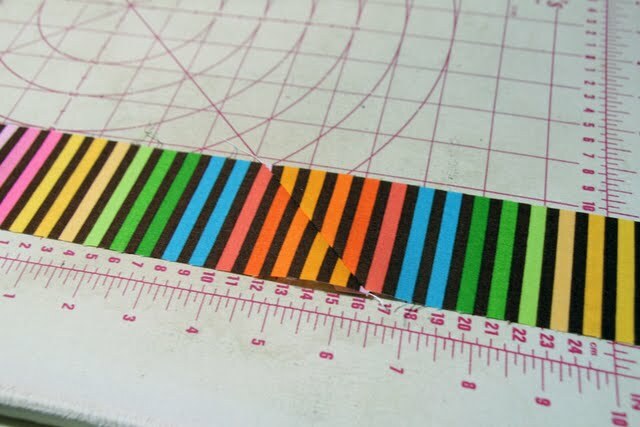 Bias cut binding can be made from single bias cut strips added up to the length needed or in a continuous manner. 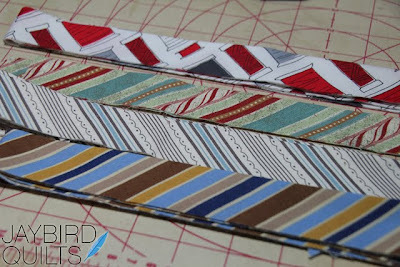 I'll go over how to make continuous binding strips in part 2. Below are 3 ways you can piece the strips together. 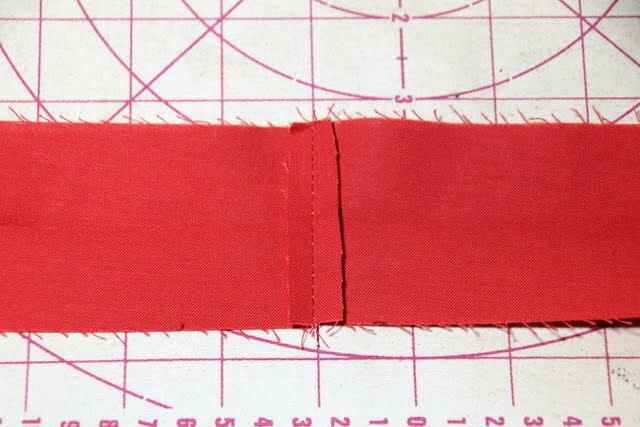 sew a diagonal line to piece the strips. continuous and I'll show you that in Part #2.
as shown below trim them off. 2. Fold the binding in half as usual. more bulk and is not recommended. Once the binding strips are pieced together I iron them in half WST since I do double fold binding. Often I'll wrap the binding around an empty spool of thread until I'm ready to put it on the quilt. Still to come in Part 2, Part 3... etc. 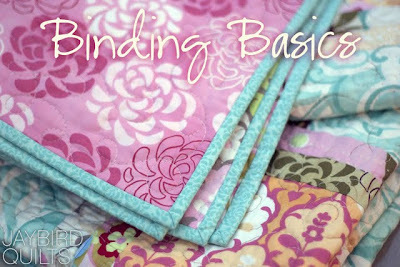 This post is in addition to the other 2 binding tutorials I've done. The goal is to fill in lots of questions I've been asked as well as go over the basics for those just getting started in quilting. Every teacher teaches things different & every book shows you things in slightly different ways. At the end of the day there really is no right or wrong as long as you are happy with the result. binding wrapped around an empty spool of thread...brillant. This is FANTASTIC! Thank you so so much for taking the time to do this! Thank you SO much for putting this together Julie - even "old dogs" can learn new tricks! Great video Julie! Thanks so much for the tutorial. Binding is my least favorite thing to do in quilting, but you gave some really great hints. Wow Julie!!! Great tips and video - Thank You very much for taking the time to put this all together to share with us. Awesome!!! This is so helpful. I didn't really "get" why bias is stronger until I heard you explain it on the video. Aha! Excellent info - and so much of it, too!!! Handstitching doesn't seem nearly as intimidating now. Thanks for putting so much effort into this! Will be tuning into the rest! Loved the video! Thanks so much for the lesson. Wonderful video! You explained it all so well and its great for people to be able to see you manipulate the corners as you go. The shelves of fabric...oh yea, looking oh so good! Thanks for all the work that went into this. Well you've placed the video camera, video is succeeded, congratulations! if you were here... I would hug you! Thank you so much for this. 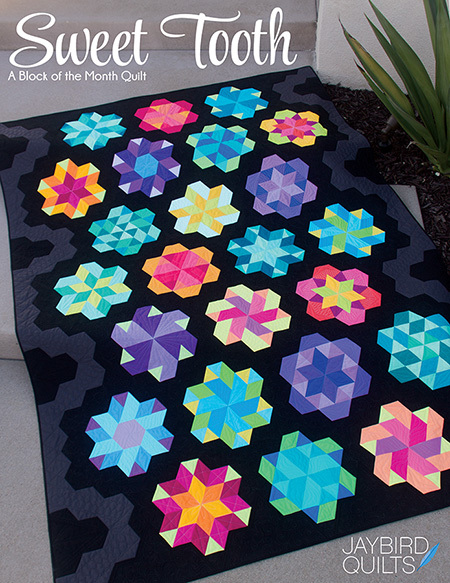 I have a quilt I've been putting off binding for a month so this really gets me in the mood. Thank you so much for doing these tutorials! 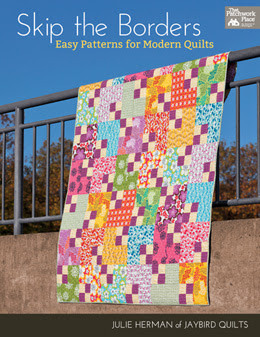 I used your other tuts for the last quilt I bound I can't wait to learn more! I like binding too! It doesn't bother me to do it at all. I loved your tutorial very well done. and very helpfull. Thank You! Thanks so much for putting together this video! 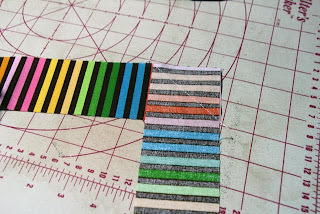 My recent first binding experience didn't go so well so I look forward to trying your method on my next quilt. 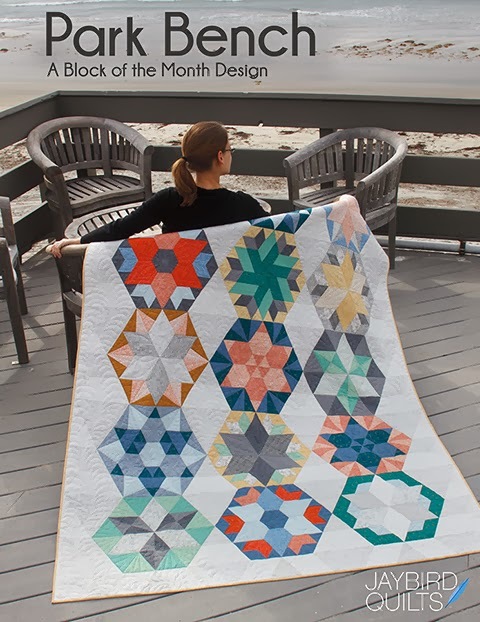 Will definitely be sharing your site with any customers asking for quilting help! Thanks for the easy directions. I am one of those who hate binding. usually do it by machine and it does not look the best but now I can try your way. I am wondering if you double your thread or do you hand sew with one strand?? Thank you for the great video! You made it so clear and understandable! Can't wait to see more! It's so sweet of you to share your knowledge like this! I'm just putting my 2nd ever quilt together and I am really looking forward to using your ideas! Thanks so much! Cheers! Great video Julie, I love binding too,it's a very relaxing process for me. I will try your knot technique and look forward to your next video. I don't know if there is anyone else like me but I always hand stitch on the front of the quilt. I like to see the stitches..Thanks again! Yay! So awesome thanks. Love the How to calculate part. I always take a guess and totally buy too much fabric. LOVE LOVE LOVE the video - you did a fantastic job. I so enjoyed watching it! Great tutorial! I pretty much bind the way you do, with the exception of using an empty toilet paper roll to wrap the binding around. I haven't really made bias binding, so I look forward to your next tutorial! Thank you! This is so awesome! THANK YOU so very much for making these wonderful tutorials! 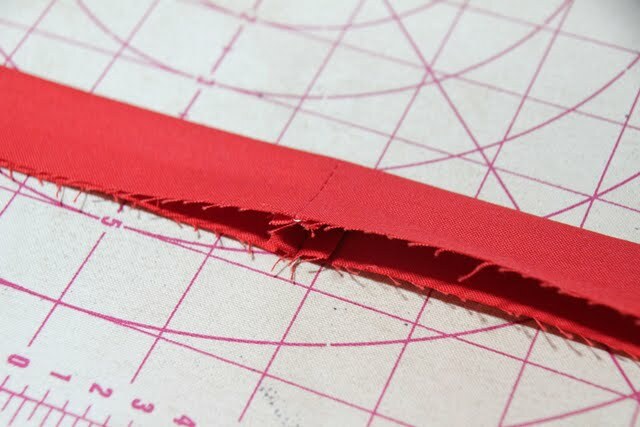 I have only used SOG binding since I am new to quilting and bias cut binding seemed too complicated. I can't wait to part #2 & #3! I popped in really quick to grab your link, I'm featuring your bag on the ol' blog today. I love binding, I make tons of it at a time, I will have to start wrapping it on spools now! Oh boy, it looks I just learned how to use the computer! If a pattern gives yardage requirements for SOG binding, but I want to use Bias, how much do I need to add? Thanks for all the tips. I have never used Bias strips before. 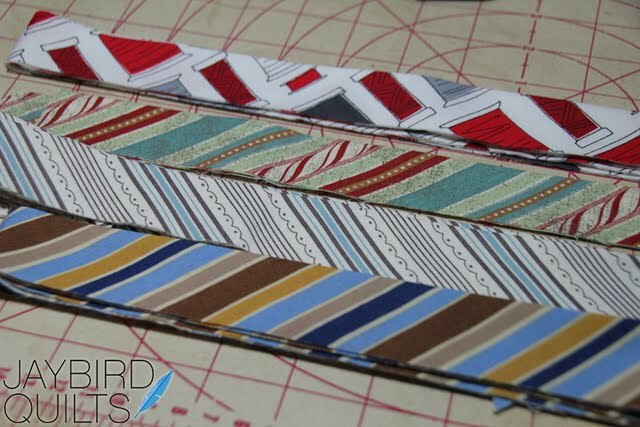 Are you going to show the best way to cut our fabric to get the most strips for our yardage? AWESOME tutorial and info! Great video as well. Thank you SO much. Great job...yet one more reason to love your blog!! Thank you for taking the time to put something soooo useful together for everyone. So glad I found these tutorials. I am usually not too pleased with my mitered corners. This will help. good solid instructions. I really appreciate your tutorial. And I think you've convinced me to switch my binding technique to bias binding. What you said makes so much sense. 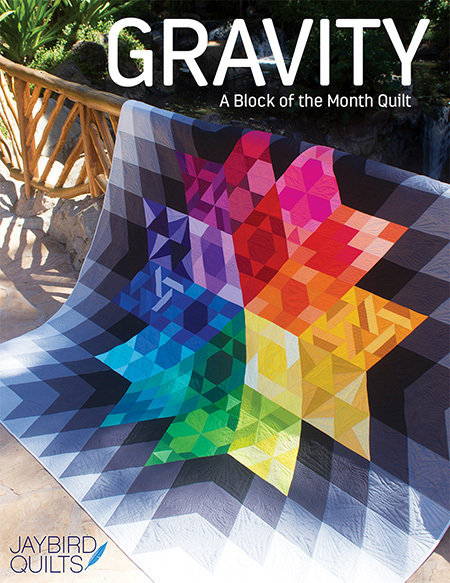 I will try it out on my next quilt. great video, thanks! And excellent stash. Question: Do you not sew down the corner on the front side? I learned to go up the back of the corner (from the inside to the outside point), and at the last stitch, send your needle through to the front side of the quilt and sew back down to the inside of the corner. Then send your needle back through to the back of the quilt and you're ready to continue sewing the binding down the next side. I thought that was a neat idea and helps me address the whole corner at one time, instead of leaving anything to the last. You look so cute! And I never really knew the difference between bias and SOG binding. I actually prefer bias binding even though it takes a little more time to prepare. Great tutorial as always. Thank you! thanks for your help (again !) ; you make it easy and give me confidence ! next binding I do WILL be bias ! the one I'm doing now I already have it ready to go and it's straight ! Thanks for sharing this information - it is great!! Awesome video...thanks! 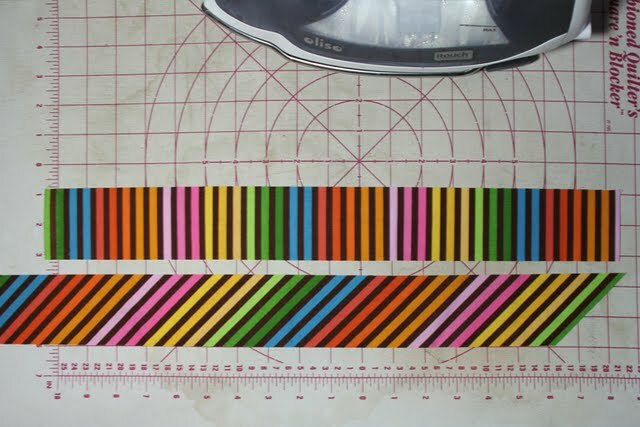 I like binding, too, and you've convinced me to try a bias cut binding on my next quilt! I've always just thought bias binding was needed if you had curves. I never thought about the strength issue- definately worth that extra bit of fiddle and fabric. Also I've never used clips - just turned it over as I sew. Thanks for two new tricks! I'm converted! Also suffering fabric envy - my not so local shop doesn't even have that big of selection. (Sad selection in Kent, UK) I think I need to open my own shop. I'm really just now getting into quilting. I made some napkins just to practice with binding. Your video makes me feel I can do this! I'm going to try it later today and see what I get. On a napkin, of course! Not doing a quilt just yet. Thank you for a great tutorial. Thank you for your tutorial...binding is my weakness! I linked to your post on my blog! I love paper piecing! It is my absolute favorite! You'll have to check out my projects sometime! Excellent tutorials! Well-written with great photos. Your tutorials are so thorough, It's a pleasure to click on your blog Julie. Thank you!